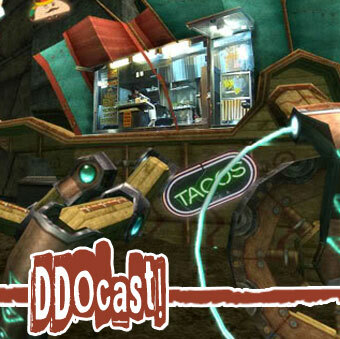 DDOcast 228 « DDOcast – A DDO Podcast! Episode 228 is ready! Here’s a LINK to the episode – just left-click to play, right-click and ‘save as’ to download as an mp3. You can find DDOcast on iTunes, the Zune Marketplace and Cyberears.com. This week Sig and Anne talk DDO news, Bug Reports, DDO Store Sales. We also have our 2nd to last DDO Poetry Corner with Skaggy the Poet. Also we have a “We’re Not at GenCon” special were we talk about the latest news on D&D from Wizards of the Coast. Sig also goes over a Crunchy Bits Live Build: The Rogue Half-Orc Acrobat! Skaggy is retiring from DDO Poetry Corner to regarge his creative batteries. Let’s send him a fond fairwell! We would love to hear your “We Love Skaggy” Poems and Messages! It would be very awesome if you could leave a message on our DDOCast Hotliine at 1-650-DDO-LICH (1-650-336-5424). If you don’t want to call you can always email us your messages or mp3 recordings at ddocast@gmail.com. 8:57 What’s New with Us! 36:11 Crunchy Bits Live: Orcrobats! 53:00 Last Call: Visit us PAX Prime 2011!! LINK for Moar Kobolds in DDO! LINK for BUG: Odd Character Deleting Issue? LINK for KorthosCast is back up and running: Episode 2 – Jumping on the Boat! LINK for Turbine/Warner Brothers Entertainment Group needs more Kobold Workers! LINK for PAX Prime Schedule!